Toshiba America Business Solutions is helping to enhance the visitor experience at Crazy Horse Memorial – the world’s largest mountain carving – through the inclusion of the company’s Ellumina™ digital signage line. The monument, located in the Black Hills of South Dakota, is dedicated to Lakota leader Crazy Horse and preserving the rich culture of Native Americans throughout North America. 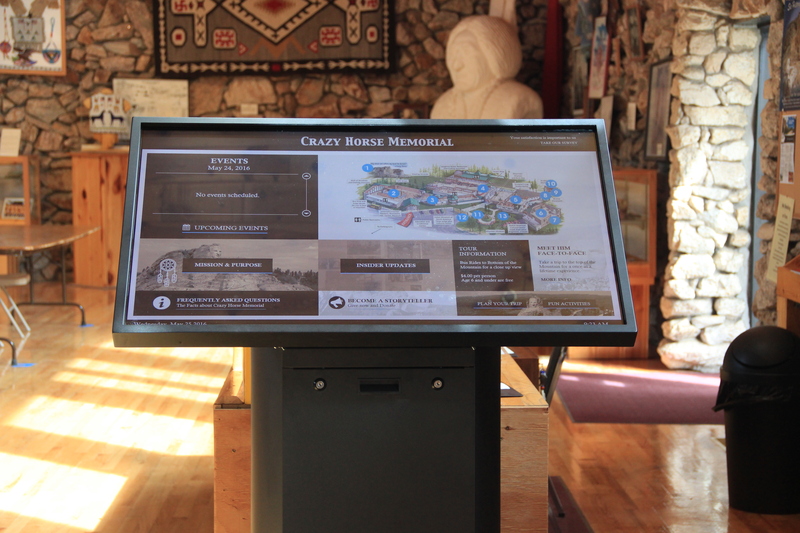 Toshiba’s Virtuoso interactive touch screen displays – the signature hardware element of its Ellumina line – are prominent throughout the Crazy Horse Memorial visitor complex. Featuring a broad array of information including highlights of the day’s activities, illustrated maps and tips for improving visitors’ tour experience, the interactive displays help inform and guide guests. Toshiba’s interactive touch screen displays (ranging from 46- to 55-inches in diameter) are integrated throughout the spacious visitor complex including the Welcome Center, the Indian Museum of North America, Native American Educational & Cultural Center, Mountain Carving Room and Covered Porch. The Covered Porch sits on the footprint of the home of the monument’s original sculptor, Korczak Ziolkowski. Toshiba’s Virtuosos are helping museum guests immerse themselves in the history of the Memorial and the culture of North American Indians. The interactive displays specifically allow visitors to sign-up for newsletters, complete visitor surveys to share their insights about the experience, and register to ‘Become a Storyteller,’ by making a charitable gift to the Foundation. Welcome Center: Toshiba’s display educates visitors on the Memorial’s mission to protect and preserve the culture, tradition and living heritage of North America Indians while continuing progress to complete the Crazy Horse sculpture. Indian Museum of North America: Virtuoso content informs guests about the distinct native cultural aspects of different regions, including the varying housing, clothing, food and art of Native Americans indigenous to North America. Native American Educational & Cultural Center: Toshiba’s Virtuoso content spotlights local artists and the unique collection of art they’ve created. Moreover, Toshiba’s digital signage educates visitors on the museum’s assembly of Native American flags while outlining the history exclusive to the tribes associated with each flag. Covered Porch: The Virtuoso pinpoints the vast array of touchstone events surrounding the creation of Crazy Horse Memorial and the Ziolkowski family. The Memorial’s timeline also provides visitors with a vivid photographic glimpse of the sculpture’s progress, from the time it started on June 3, 1948 to its current state. Mountain Carving Room: This unique digital signage application contrasts the size of the massive Crazy Horse Memorial with such iconic historical structures as the Great Pyramids, Taj Mahal, Roman Colosseum, Statue of Liberty and Mount Rushmore. Acting as repository for Native American art and artifacts through the Indian Museum of North America® and the Native American Educational and Cultural Center®. Establishing and offering academic programming in the Indian University of North America®, and when practical, a medical training center.